The City of Kenmore has hired Chief Peter Horvath as the new Chief of Police, effective May 24, 2018. Chief Horvath has served as the Interim Chief since February 5, 2018 and will take over duties as new chief immediately. The City of Kenmore contracts with the King County Sheriff’s Office to provide high quality and professional law enforcement services to the community. Chief Horvath leads a team of twelve highly trained officers, including one detective, all assigned solely to the City of Kenmore. “After an extensive interview process with candidates, I am pleased to select someone with Chief Horvath’s leadership and experience,“ stated Rob Karlinsey, City Manager. “Pete’s positive attitude and community-oriented policing philosophy will be a great fit for Kenmore”. 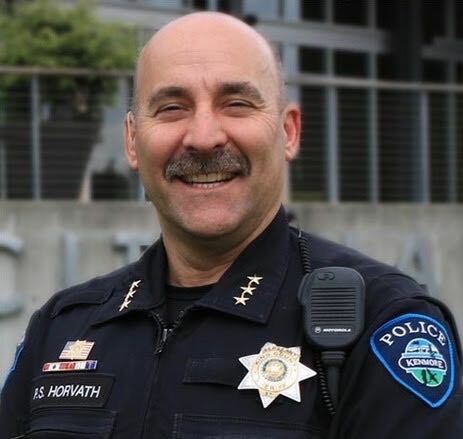 A 26-year veteran of the King County Sheriff’s Department, Chief Horvath came to Kenmore from the Sammamish Police department and has a wide range of leadership experience in patrol, tactical, and detective operations. “I am so honored to join the Kenmore family. Our department will continue to work closely with the community and build partnerships to proactively address and solve problems together,” stated Chief Horvath. Chief Horvath takes over from Chief Cliff Sether, who proudly served the Kenmore community as its first police chief after incorporation, starting on August 31st, 1998. The City of Kenmore is grateful to Chief Sether for his many years of service and commitment to Kenmore residents, families and businesses.